As we were driving down Hastings, Rich Guy began questioning which restaurants I have been to. Having never really taken stock of that, I began to cross off each one as we passed by. Wow, looks like I've been to quite a few of them! Suddenly, a new restaurant caught my eye. Well, it wasn't really hard to see. A big advertisement on the side of a building will be good enough to get my attention. 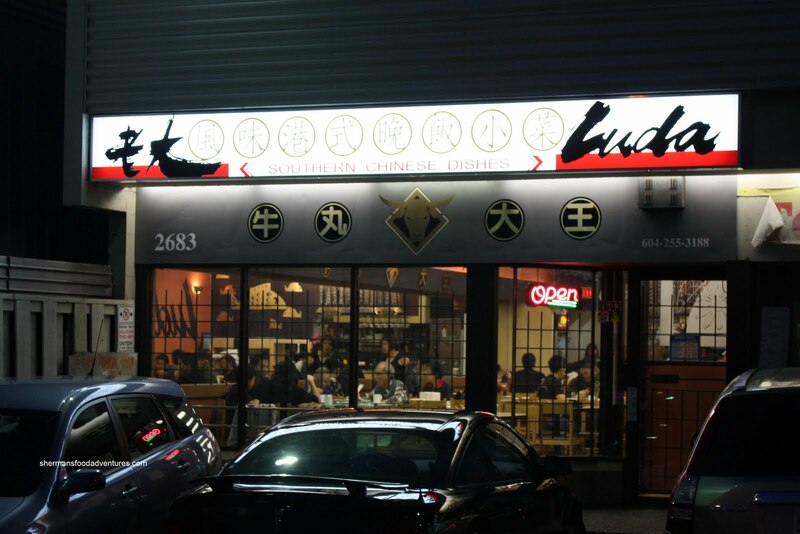 Formerly Louis Garden, now resides Luda, which specializes in Southern Chinese cuisine. Then and there, I knew this was our next eating destination. After all, we are inundated with Cantonese food. 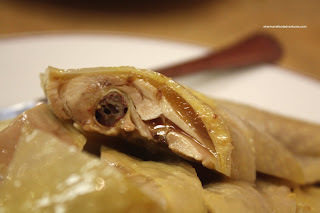 The other Chinese cuisines are poorly represe nted comparatively (well, other than Shanghainese). Remarkably, I get a text from Kim the next day asking if I wanted to try Luda. Hey, works for me, the more the merrier. So we decided to meet up on a Tuesday night with Rich Guy, myself and Viv. Epic fail... The place is closed on Tuesdays. Undeterred, we ended up going to the Reef instead. From Southern Chinese to Jamaican. Still south of some sorts right? Okay, so here we are trying again on a Friday night. We know this time it's gonna be open! Rich Guy and I arrived first and attempted to park in the one space left in the lot. Fail. It seems Crystal Mall is not the only place where people like to take up 2 spots. Why do we need lines then? Anyways, I pulled out front to get the last parallel spot. I signal and get ready to reverse. The lady behind me not only pulls up close to me, she tries to pass me on the left as I am backing in, almost sideswiping me. Okay, do people know how to drive in this city??? I took transit earlier in the day and it was so relaxing... Maybe I'll do that more... Ultimately we had more problems with the menu than our parking woes. The specialties were written in Chinese and Viv wasn't here to decode it for us. Yikes! 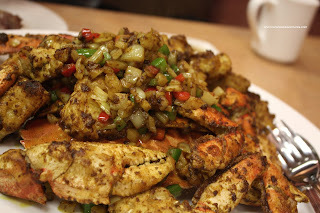 Well, we decided to take some of their recommendations starting with the Curry Crab. 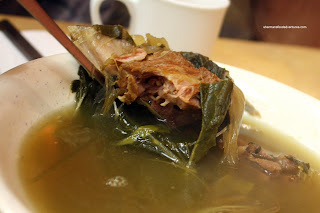 But before that, we got the complimentary Daily Soup (which was dried Bak Choy and Pork Bones). A solid lo foh tong (or old flame soup). Modestly seasoned and full of ingredients. Alright, back to the crab... Let's get this out of the way first. I have a personal preference where I like crab prepared as simple as possible. Since the flavour of crab is so delicate, anything other than steaming it with a little bit of garlic, it usually gets lost. With that being said, the curry was quite good if not a bit sweet. A conservative dash of spicy with sweet and savoury made for a flavourful dish. The crab was perfectly fluffy and fresh (well, it was live). The only thing I could fault with the dish was the liberal use of oil; however, it really cannot be avoided since the crab is fried and it then needs to be wok-tossed in more oil. 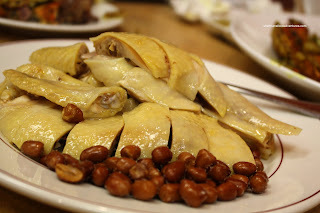 One dish we actually chose ourselves was the Hainanese Chicken. 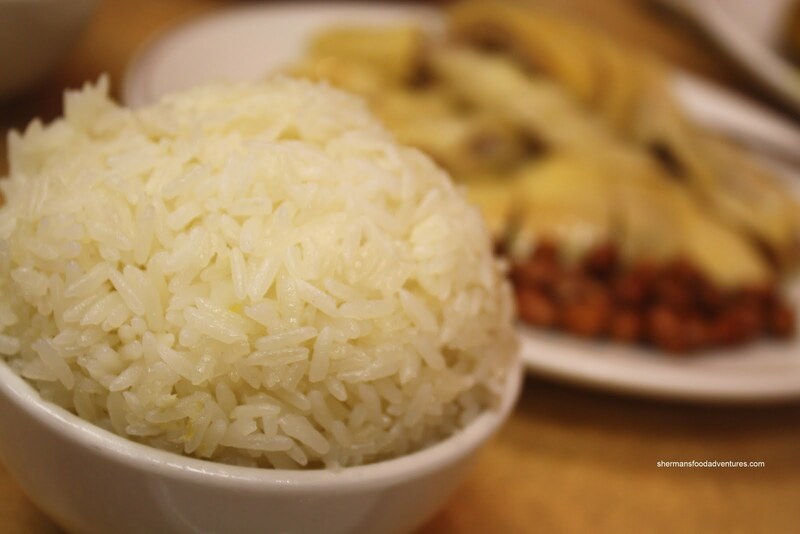 We added 2 bowls of Chicken Oil Rice to accompanying it (not the same without it!). Rich Guy was dismayed that this version was the free-range type with bones, unlike the Singaporean one. For me, each type has its good and bad points. 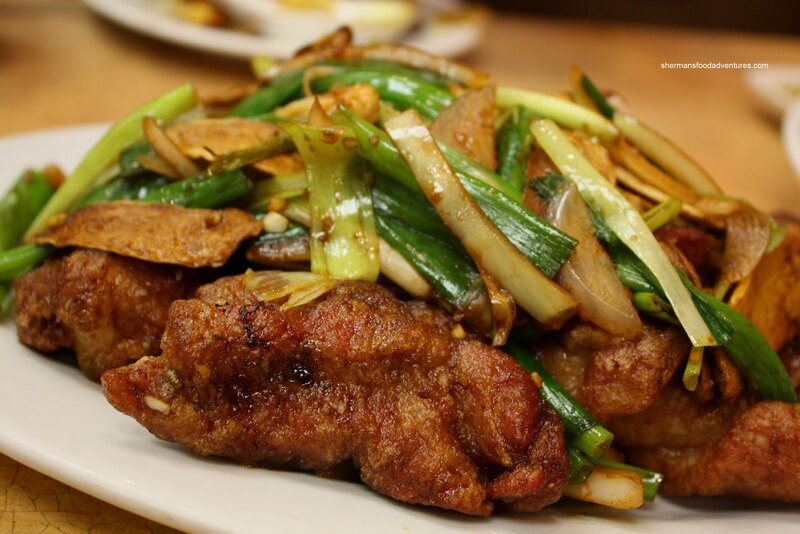 Much like the one you'd get at Mui Garden, the chicken is a bit chewier and leaner. The one here had the desired gelatin between the skin and meat. Hey, it was well-executed free-range Hainanese chicken. However, I wasn't too fond of the rice though. It was quite dry and bland. Another recommended dish was the Pork Ribs with Ginger and Onion. The ribs were fatty and tender. I didn't get too much ginger and onion flavour even though I could see it clearly on the plate. Rather, I got light sweet soy instead. No matter, the dish was still decent. 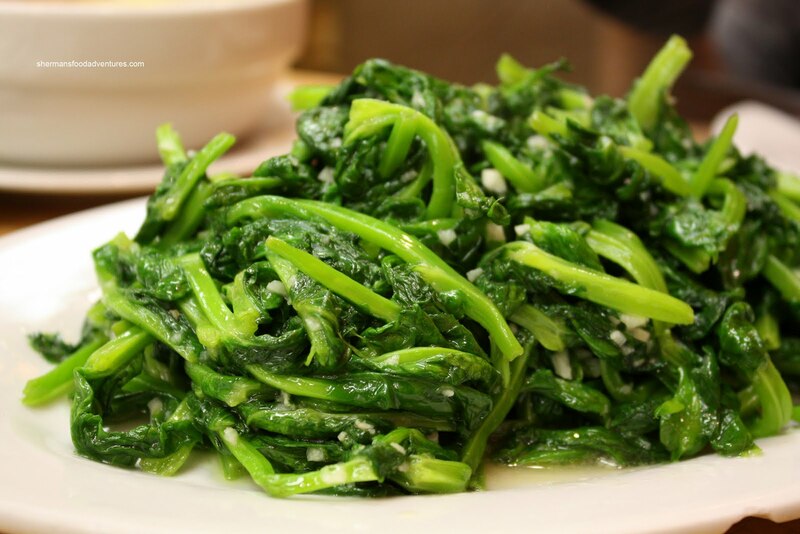 Lastly, we got our daily intake of veggies in the form of Stir-Fried Garlic Pea Shoots. Yet another well-cooked dish. The pea shoots were tender while still exhibiting a slight crunch. I also liked that there was very little liquid at the bottom of the plate, a clear indication of proper wok heat (wok hay). I could definitely taste the garlic; yet it could've stood for more salt. I found the dish to be rather greasy. I had to constantly wipe my lips after eating it. Pretty decent eats here at Luda. Other than some minor issues, the food was well-executed. Furthermore, it appears that the raw materials are of high quality as well. The crab was meaty (not an emaciated one), the chicken was good, ribs were meaty and tender and the pea shoots were fresh (not old). Not really much to complain about really other than the price. We found the prices to be on the high end for this class of restaurant. Sure, the food was pretty good and so were the ingredients; however, our bill came out to be $83.00 before tip. Honestly, if I were in the neighbourhood, I would consider coming back. Otherwise, there are quite a few Chinese restaurants in the GVRD with nearly the same food quality at a lower price point. Hey, thanks for tagging along on this one. Can I call it scary that, for the most part, we agreed again??? :P As for that driving incident, you can't take out the Richmond from some people! For some reason Luda reminds me of that rapper Ludacris. HAHAHA Anyway, the food here is like you said, well executed for a place like this on Hastings. There is this new place that I've tried over the weekend and was thinking of telling you about! So many restaurants to try ...especially in the Chinese category. At least for me, anyway. The crab in particular sounded delicious. I love crab, and I agree with you, Sherman. The simpler, the better. Oh no, it's happening to me again. I check out Kim's write-up of Luda, drool over the pics. Come over to Sherman's ....... and whoa I find myself in a parallel universe. Again. Kim, anytime. I like eating. Duh. Anita, yes I like this place. Only if it is closer and a bit cheaper. Darina, absolutely. Seafood is so delicate. No need to hide the natural flavours. anyone have the link to kim blog?